DAB radio expert Pure has launched the world's first self-install in-car DAB digital radio. Called the Pure Highway, the groundbreaking product allows users to access DAB radio through the car's existing FM radio ­- meaning there's no need for a messy digital-compatible aerial installation. Just like a satnav system, the new Highway unit attaches to the inside of your windscreen and is powered by the car's cigarette lighter. The unit's discreet DAB aerial sends a radio signal to the car's FM aerial, where it is picked up like a normal station. The unit has a line-level input for iPods, too. 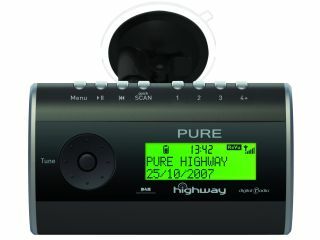 Pure's Highway can even be used as a personal DAB radio: there's a stereo line-output for headphones and it can give up to six hours of listening from two AA batteries. Further features include Pures's ReVu technology, which enables listeners to pause and rewind live DAB, and new features can even be added as they become available via USB. To get buyers started, each radio has four preloaded presets, giving one-touch tuning to Virgin Radio, talkSPORT, Planet Rock and theJazz, plus all DAB stations can be ranked alphabetically, rather than by frequency. The good news is that the unit will be in the shops in time for Christmas, priced at £70.